Fill your mealtimes with flavorful favorites from our meal plan service! Our Top 10 Recipes of 2018 include unforgettable dinners like Tuna Poke Bowl and Lasagna Soup. At the beginning of each new year, it’s always exciting to look toward a wide open future and set goals for new things to try. However, in the midst of looking ahead, it’s a great idea to bring some of last year’s best experiences along with you as well. To help enrich 2019 with your favorite flavors, we put together a list of our 10 best recipes of 2018. (Okay, there are 11 meals, but the last 3 are tied in the same place . . . And top 10 simply sounds better! 😉 ) This list comes from the feedback and ratings given by our fantastic community for every meal last year. Our rating system is based on 5 stars, with 1 being “Boo, didn’t like it!” and 5 being “This was soooo yummy I want to eat it every day!”. Find out why these top 10 recipes made the cut! And if you haven’t made these meals yet, they are a great introduction to what we offer as part of our meal plan service. Hawaiian Poke has become all the rage in the past couple years and, unsurprisingly, our poke bowls are right at the top of our community favorites for the 2nd year in a row. These 30-minute, no-cook bowls ensure dinner gets on the table in a jiffy while still packing all of the refreshing flavors of avocado, edamame, raw fish (or shrimp! ), and spicy garlic mayo. With single-sheet-pan roasting and an easy baby kale salad, it’s no surprise this colorful meal is a 2018 favorite. Amidst the seasoned salmon and roasted oregano potatoes, our community found that the secret star of the show is our unique bell pepper and olive salsa. Its delightful flavor flawlessly brings each part of this meal’s Greek inspiration together. While classic lasagna is time-consuming to make, our members found the perfect solution in our deconstructed Lasagna Soup recipe! With Italian sausage, ricotta, noodles, mushrooms, and spinach, it’s easy to enjoy all of the heartwarming flavors of lasagna in a fraction of the time. Whether using seasoned ground turkey or beef, our community sang the praises of this 30-minute taco salad. With fresh veggies, creamy avocados, Mexican cheeses, crunchy tortilla chips, and honey adobo dressing, this meal is a must try. We first featured this meal back in 2015 and then brought it back last year because it was such a hit. While our miso-lime butter is the true star of the show, many of our community members (even kids!) 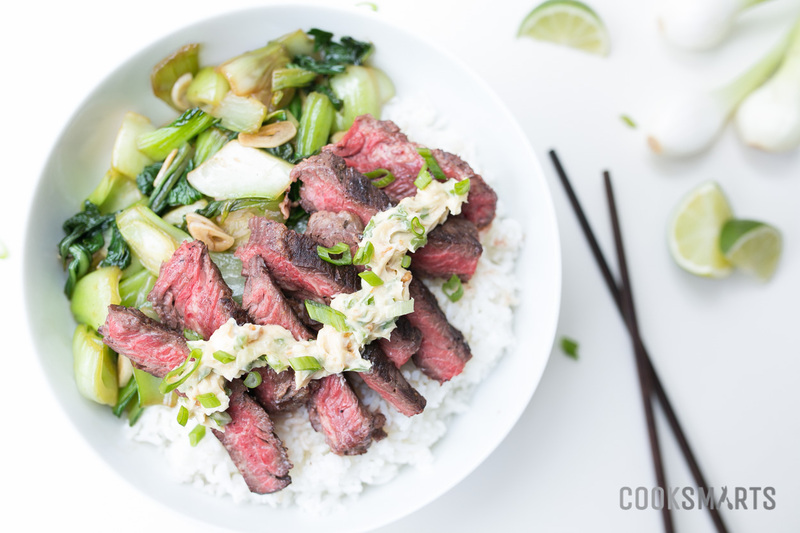 found a new love of bok choy through this delicious recipe as well. Another top recipe of 2018 is the indulgent brunch (or breakfast-for-dinner) that gave our community members one more thing to celebrate during the holidays. After all, it rarely gets better than buttermilk pancakes with a ham, spinach, and tater tot egg-bake! In 7th place are our Italian-inspired naan pizzas that are topped with mozzarella, basil pesto, and fresh tomatoes. With delicious grilled peaches and zucchini on the side, our members loved how this pizza came together with delightful flavors and effortless finesse. With a chimichurri sauce and tangy corn and black bean salsa, these shrimp tacos had our community thinking about making these again the moment they finished dinner! Finishing our 2018 favorites is a 3-way tie between our Balsamic Chicken & Spinach Salad, Cajun Shrimp Po’ Boy, and Slow Cooker Sopa Azteca. Our Cook Smarts members simply raved about the flavors in these meals that only take 25 minutes of active cooking! Though simple to make, all three dishes stand out with amazing flavor, thanks to a homemade vinaigrette, Cajun spices, and slow simmering. Now that you’ve heard about 2018’s mouth-watering favorites, you’ll be thrilled to know that all of these recipes (in all 4 versions, which includes Gluten-Free, Vegetarian, and Paleo!) are a part of our recipe archives. While you continue to receive delectable meals and ingenious tools from us each week, make sure you revisit last year’s hits as well to make 2019 your most delicious year yet! If one of your favorite recipes of 2018 wasn’t included in this list, let us know what meal you’ll be bringing back this year in the comments below. Meal plan with us Today! We want to see your cooking! If you make any of the meals above, be sure to tag us #cooksmarts on Instagram, so we can see your delicious food photos!